During August 2007, a survey was conducted in the northwestern area of the Kefar Sava (Permit No. A-5206; map ref. 18981–9086/67703–831), prior to development. 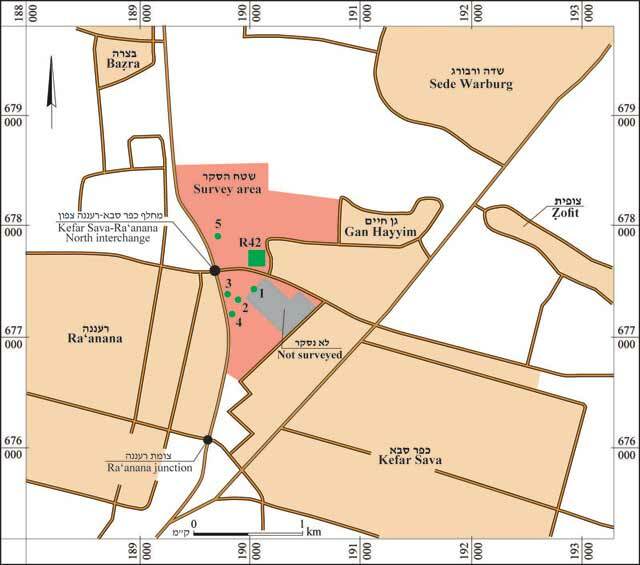 The survey, undertaken on behalf of the Israel Antiquities Authority and underwritten by Kfar Saba Economic Development Company, was performed by P. Spivak, assisted by L. Yihye (surveying). The region is characterized by hamra hills from the Pleistocene period; signs of massive modern activity are visible along the landscape. Flint tools dating to the Middle Palaeolithic and Epi-palaeolithic periods (Trigonometric Point R42; Fig. 1) had previously been documented in the region. The survey area (c. 2 sq km) was not completely explored due to technical limitations. Only several flint artifacts were found on the surface of the hamra outcrops in the current survey. The poorly preserved artifacts were mostly worn and covered with yellow patina, which is characteristic of the region. Several Levallois flakes that could be attributed to the Middle Palaeolithic period were identified among the recovered artifacts. Non-diagnostic and worn potsherds and fragments of glass vessels were also found. No other archaeological remains were traced in the mechanically dug probes.